Reader warning: This review contains spoilers. Sal is back with their list unfinished, their girlfriend kidnapped, and severed children’s ears popping up all over. Magic it seems, is also back, and being used for nefarious purposes. Sal wants nothing more than to finish their revenge, but shadows are returning in the North and Rath, their childhood friend, needs their help. Sal must stop the shadows and the magic making them, find the missing children, and fulfill the queen’s orders before they can finish avenging Nacea. Nacea, however, has some avenging of its own to do. A compelling sequel, Ruin of Stars follows Sal on their journey of revenge and redemption. A number of twists occur in the narrative, from Rath’s heartbreaking murder to the revelation that many other Nacean’s survived the massacre that left Sal orphaned. Sal’s desire for revenge is thick yet relatable, and their emotions strong but never overwhelming. The action scenes, as in Mask of Shadows, were exceptional and the gore was perfectly balanced. Of note in this book is the change in emphasis on Sal’s gender. Mask of Shadows all but ignores Sal’s gender fluidity and focuses nearly entirely on the narrative. This allows the reader to easily move through Sal’s changing gender expression with little catching, so seamlessly is it a part of the world. In Ruin of Stars, Sal’s gender is a point of contention and frequently called out in the first half of the novel. This shift is jarring, although it does serve as a solid break between the two countries and their different ideologies. With the newfound emphasis on Sal’s fluid gender, it seems odd that their pronouns remain “them” through the narrative, instead of swapping between he, she, and them as in the first book. It is unclear whether this is a choice the character has made (perhaps for ease of use in unfamiliar lands), or whether it is an editorial decision. The discussion of gender, as well as bisexuality and aromanticism, is far more blatant in this sequel, and it is nice to see some of the lesser-known aspects of the queer spectrum explored on page. The early pacing of the book falls into a standard YA line with a slow start that makes it difficult to get hooked. There is a steep remembering curve of character names, especially, but this resolves midway through the book when the pacing, and action pick up. The pacing is still much faster than many adult epic fantasy novels, however, and the transition between scenes much more fluid. Also of note was the amount of repetition in the book. It often feels like Sal rehashes the same two or three things in their head every other page. This was wearying to read and numerous times slows down the action. There seems to be little additional character development for Sal in this book, instead relying on the strong work done in Mask of Shadows to carry this narrative to its conclusion which, to be fair, is stunning. Other characters, however, have excellent development, including the love interest Elise, who proves to be far more robust than originally described. The villains, as well, are perfectly balanced in the morally grey, which casts doubt on Sal’s motivations and gives the book much more depth than Mask of Shadows. The final 150 pages are worth every internal dalliance. The making of the shadows is both delightful and horrifying, and the final death sequences are so filled with anticipation, thrill, and satisfaction that it is hard to read without triumphant yelling. 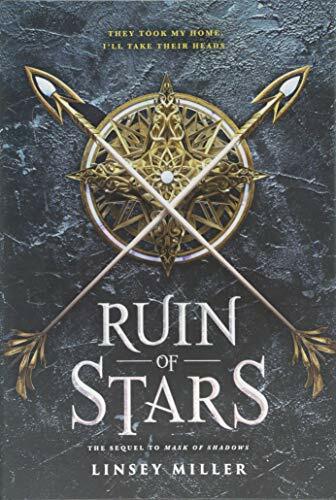 Ruin of Stars is perfectly primed for YA readership, with an expansive, three-dimensional cast of queer characters, stunning action sequences, and a level of fantasy violence that offers escapism without gratuitous gore. A fine sequel to Mask of Shadows, Ruin of Stars, with its beautiful cover art and dynamic hero(ine) belongs on every bookshelf.